Our winter just wants to hang on with temperatures dipping below zero degrees F for days. Keeping the animals warm and dry can be a challenge. I use this open shed for my cattle. They choose when they want to go inside. The door faces south with a half wall on the east. The north and west sides are closed. The cattle often spend the cold, crisp nights outside laying on the ground chewing their cud. The cold wet snow sometimes drives them inside, but even then, they stay outside a big part of the day and night. A good indicator that they are warm, is when snow lies on their backs. It sounds crazy, but their hair will insulate them enough that the snow doesn’t bother them. It is a very different story when their hair gets wet. They lose their insulation power. They cannot get warm without getting dry first. They will hump up and shiver trying almost anything to stay warm. A simple 3 sided shed with a good roof is very serviceable for this purpose. Usually a windbreak is plenty for cattle. 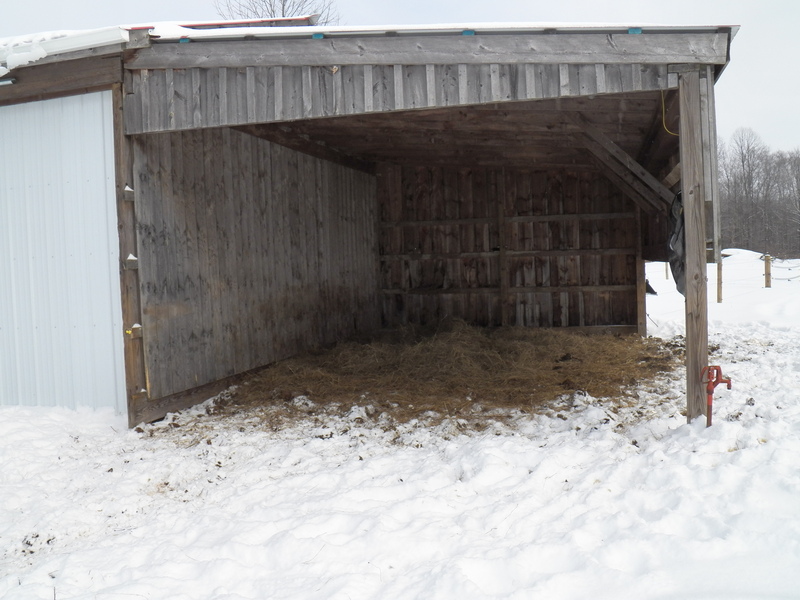 A row of bales, a board fence, a stand of pines or even the side of a building will work, but when they get wet they will really enjoy the protection of a roof, especially in winter. My goal is to have a 3 sided shed in every paddock. The sheds also provide shade from the hot sun in summer. They make a great spot for protection from a spring hail storm or hard rain, not to mention the wet sleet days of late autumn. I also use them to store equipment in vacant paddocks over winter or perhaps the stick the grain drill as I rush from the fields to beat a rain storm. As winter slogs on, refusing to ease its grip, I stay warm shoveling manure from animal pens or wrapped in a homemade quilt. The animals stay warm in the barn or in sheds like the one pictured. I know all is well when the animals are standing outside soaking up the sun or even laying in the snow. If they are inside looking out or bedded down there, it usually means bad weather looms….or its already here…. and to think the uninformed call them…dumb animals!